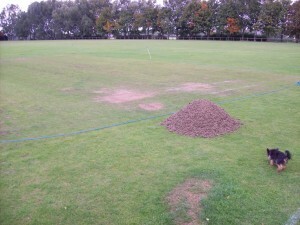 ProGroundCare has years of experience managing the Buckden Cricket Club square and outfield so if you’d like to see our work there by all means pop down and take a critical look; the ground is at PE19 5UY. We can offer complete season round treatment for the square from a September renovation to a Spring moss treatment and aeration along with weed and disease management. Square renovation with a little help from a friend! Please call us for further details on 01480 812393.